LaVyrle was born on July 17, 1943 in Browerville, Minnesota, USA, where she grew up. Married with her high school sweetheart Dan Spencer, shortly after her graduation, they had two daughters, Amy and Beth (d. 1990). LaVyrle worked as a teacher's aide at Osseo Junior High School, when in her thirties, she read Kathleen E. Woodwiss's novel "The Flame and Flower", which gave her the idea to become a novelist. She decided to try transferring to paper a recurring dream she was having about a story based on her grandmother's lifestyle on a Minnesota farm. Her story became her first manuscript, The Fulfillment, that she sent to Kathleen E. Woodiwiss. The bestselling author read the novel and promptly mailed it to her own editor at Avon. The editor purchased the novel, which was published in 1979. 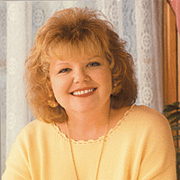 She was inducted into the Romance Writers of America Hall of Fame in 1988. She wrote 23 sweet historical and contemporary novels. Published around the world, her works included 12 New York Times Bestsellers, and have been won 4 RITA Awards, 3 Golden Medallion Award and a Minnesota Book Awards. LaVyrle said: "the trademark of my books is mending relationships, showing people how to mend relationships." LaVyrle was a founding member of the Midwest Fiction Writers (MFW), chapter 24 of the Romance Writers of America. Four of LaVyrle's novels were produced as television movies: The Fulfillment in 1989 (She and her husband appear as extras in the film), Morning Glory in 1993, Home Song in 1996 and Family Blessings in 1999. LaVyrle and her husband are grandparents. Her husband was a retired estimator for a general contractor, and she also decided to retire from writing in 1997, after 18 years of career. They live in a Victorian house in her native Minnesota, where she enjoys gardening, cooking, playing bass guitar and electric piano, and photography. LaVyrle Spencer is currently considered a "single author." If one or more works are by a distinct, homonymous authors, go ahead and split the author. LaVyrle Spencer is composed of 17 names. You can examine and separate out names.